Imagine getting up from your couch, looking out the window, and seeing this in the back yard. It happened in Rockaway, NJ and one brave soul in the neighbourhood got out his phone to capture everything on camera. 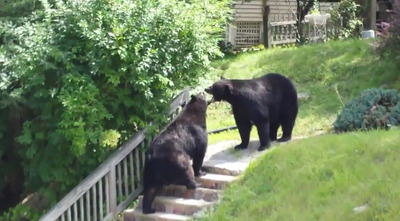 The Daily Record reports that the two bears started fighting in an area they think is between two large forests. They talked to the Department of Environmental Protection to try and get to the bottom of this battle. They said it appears to be a fight between two male bears. It began in what appears to be someone’s backyard. Followed by an epic standoff on the stairway. Before moving to the street for the big battle royale. The Daily Record notes that the Department of Environmental Protection told them that fights like these between animals is not rare. The location, however, is certainly out of the ordinary.